My car needed an oil change. I looked at my phone, willing it to make the appointment for me. How difficult is it to pick it up, dial the number, go through the motions? It’s not very hard, but, just the idea of speaking to a stranger on the phone brought on unwanted anxiety. I took a moment to compose myself. “You can do this, just pick up the phone and dial the number.” My little pep talk to myself. Once the appointment was made, I ended the call, put the phone down and let out the breathe that I was holding, finally relaxing. I noticed my anxiety and wondered, why. Why, after all these years, do I still not want to talk on the phone? Why is it so hard to talk to a stranger, even if it’s to make an appointment? I don’t know the answer, but it’s something to think about. I’ll be frank, I’m not a fan of the trend towards 3D movies. There are few movies that I like in 3D, those tend to be the cartoons. Action movies in 3D? Not so much. When I saw these, I thought they were a joke, but they aren’t! 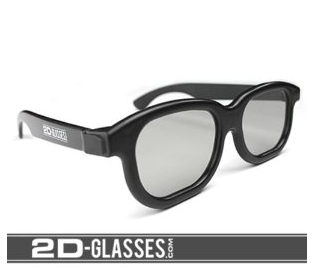 The idea that you can wear glasses to readjust the 3D images to 2D is WONDERFUL! Why didn’t I think of this!? The great part? It costs $10 (including shipping) and you can purchase it on Amazon.com!